When the lease of the beloved Porto Maltese seafood restaurant in Kyiv changed hands, the new owners spotted an opportunity to change direction and slake the increasingly global thirst of Kyiv’s talking classes. 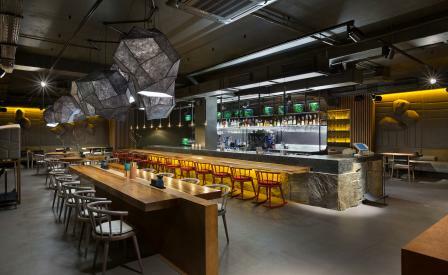 The result eschews the rustic in favour of something far more cosmopolitan; local architects YOD Design Studio have taken the Asian-inspired brief and run with it, creating a visual melting pot that incorporates elements of East and South-East Asian culture into a coherent whole. The energy of an open kitchen takes centre stage, but interesting details abound; a sleek granite bar references the sunken bars of Japanese izakayas, and an exposed wine cellar allows diners to peruse vintages over an appetiser or two (the popcorn tiger shrimp is excellent). Meanwhile, tabletops have been carved from polished Javanese palm, lending a welcome touch of the tropics to the interior. While wine is one of the restaurant’s strong suits, we can’t resist the collection of aged Japanese whisky, expertly blended into one of the bar’s signature Manhattans.